David Ginola Ramo was seen off at the airport by members of his family and officials from the Solomon Islands Football Federation (SIFF) led by the General Secretary, Eddie Ngava. Ramo will transit through Brisbane and will arrive in Auckland later tonight. Ramo who is travelling internationally for the first time, said that he is nervous but excited at the same time. 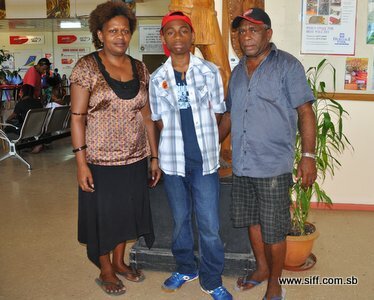 Ngava congratulated Ramo for the first time at the airport and encouraged the youngster to be confident because he is the champion out of many players from Solomon Islands. “You have earned the right to represent Solomon Islands by proving that you are a winner. I wish you all the best in the competition and I urge you to enjoy the experience,” Ngava said. Ramo won the right to represent Solomon Islands in the national event held at the Heritage Park Hotel on Saturday 7th April. The fifteen year old lad, who hails from North Malaita and Kwara’ae, was among 32 participants that competed in the event. Ramo won the grand final against Francis Kairi Jnr. after ousting some of the favourites in the competition. The Oceania finals will be held at the Sylvia Park mall in Auckland on Saturday (21st April). There Ramo will be joined by winners from Papua New Guinea, New Zealand, Tahiti and New Caledonia for the competition. The winner of the Oceania finals will progress through to the FIWC world finals. In international news related to the FIWC event, the FIFA website www.fifa.com reported that the world finals will take place at the Jumeirah Beach Hotel Dubai in the United Arab Emirates from May 21-23. FIFA and presenting partners EA SPORTS™ and PlayStation® will be flying the 24 finalists of the world’s largest online gaming tournament to Dubai for a once in a lifetime experience and the chance to be crowned FIWC champion. The FIFA website also revealed that former FIFA World Cup™ winner, New Caledonian, Christian Karembeu, is appointed as an official FIWC ambassador. Karembeu will be part of a FIFA team assessing the performance of players at the FIWC finals.